With a grant from the UO’s Williams Fund, art history professor Akiko Walley is helping introduce students to a rich collection of Japanese screen prints, teach them about printmaking and design an exhibit of prints. The project is providing important support for the Wadsworth Collection, 150 postwar-era screen prints donated to the Jordan Schnitzer Museum of Art by Jack and Susy Wadsworth. 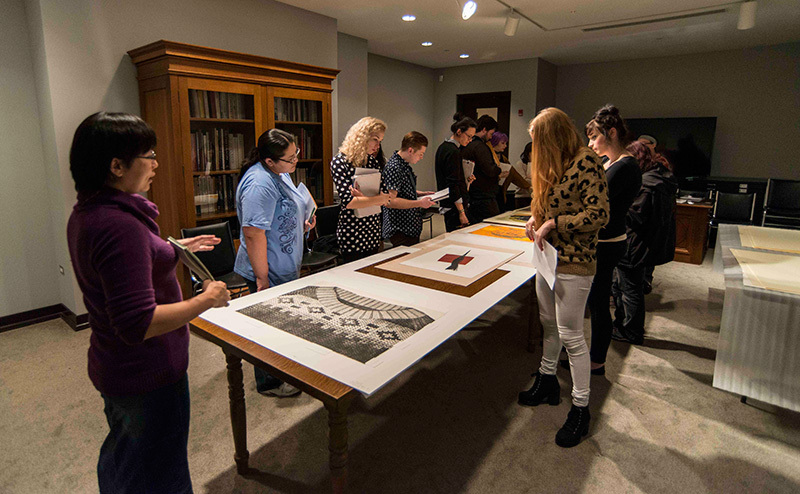 Students are learning about both the collection and the process of printmaking through Walley’s art history class Japanese Prints and Their Techniques, while another class this term is doing research and joining in plans for an upcoming exhibition and symposium centered on the Wadsworth Collection. Walley used the Williams Fund grant to travel to Japan last summer to research the collection and the printmaking tradition in preparation for the classes. She is collaborating with art professor Charlene Liu and printmaking and fibers technician Mika Boyd and with Anne Rose Kitagawa, chief curator of Asian art for the Jordan Schnitzer Museum of Art.